“The French Chef” with Julia Child. As a kid, I watched in rapt attention her obvious joy while making baguettes on that show: flinging the dough onto the counter, raising clouds of flour, and warbling her detailed instructions, cracking jokes all the while. The memory of that is what, years later, got me started baking and cooking myself. I have every one of her cookbooks (and use them regularly), about a hundred episodes of her various shows, and I think of her every day. She was one of my few heroes. From the time I watched this episode as a kid to the time I did something about it was about eighteen years, so while I may have been a slow starter, I did have a long and impressionable memory. 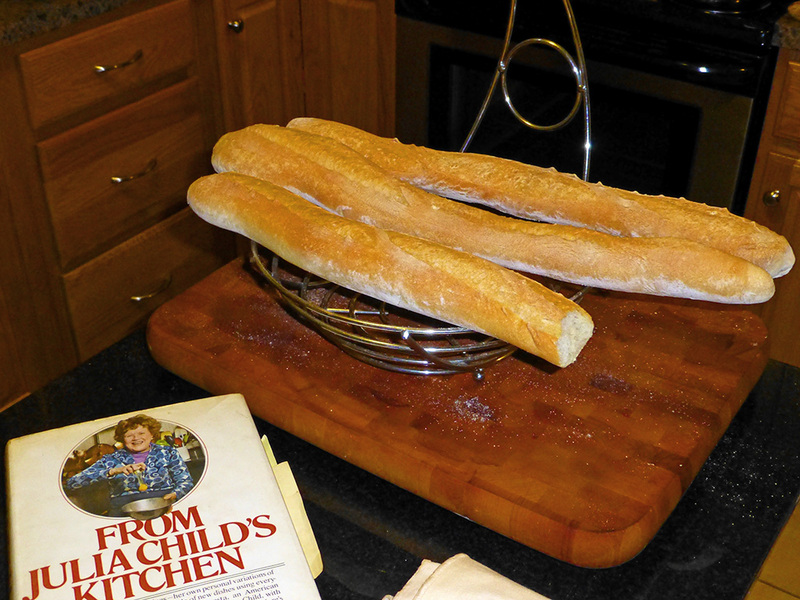 The very first thing I made was French bread, using the first cookbook I ever owned, From Julia Child’s Kitchen. Why? Because I remembered that she made it look pretty straightforward. Tonight, I thoroughly enjoyed making it again, raising clouds of flour as I kneaded and smiling at the memory of Julia doing the same. Because I’ve concentrated on sourdoughs in recent years – mainly boules because they’re great for sandwiches – I haven’t made this recipe in quite a while, but I found I remembered the ingredients exactly: a pound of flour, 1¼ cup tepid water, 2¼ teaspoons salt, and a packet of yeast – or 2¼ teaspoons out of a large jar in my case – dissolved in 1/3 cup tepid water. I did have to read her instructions on the multiple steps to form the loaves, though. They were clear as a bell, as usual. Cooling with air circulation all around. Click for a larger version. 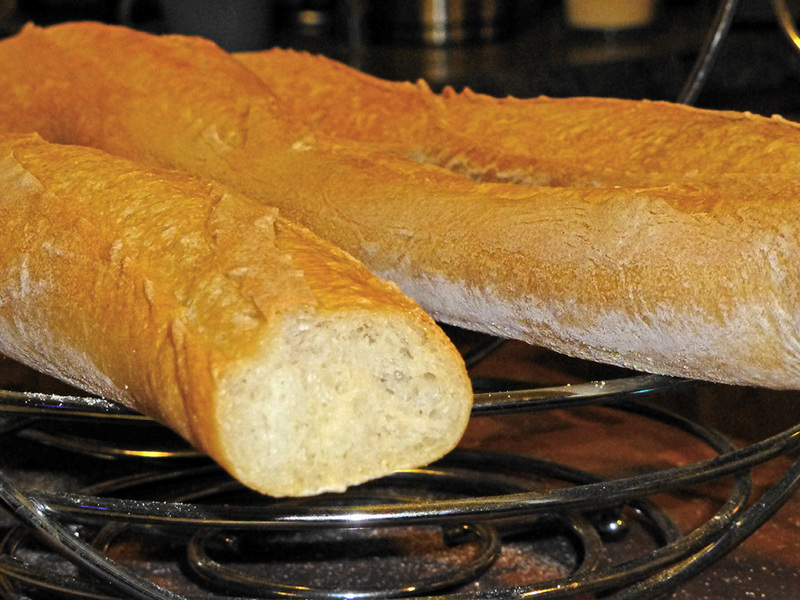 These aren’t true baguettes as they lack a few inches of length; my biggest baking sheet, just a few inches narrower than the oven itself, will accommodate loaves of 22″ if I angle them slightly. This entry was posted in Baking, Julia Child. And what an exciting moment that must have been when you took those first loaves out of the oven ! And then bit into a piece of that warm crusty deliciousness! We have such good bread here almost everywhere that we pretty much take this for granted. It’s one of the hardest things to find when I cross the borders of France for lands afar. I too started making bread after having french bread for the first time…as a teenager on my first trip to France with my Pop. He ate a lot of pastry. Me a mix of bread and sweets! In the whole two weeks we might have had three “real” meals. yes these are the things that make us. Make us who we are. this is just terrific Lalo! Just finished watching it. bread making is very daunting but her precision and detail is absolutely “incroyable” ! And loved the last part which takes place in a Parisian bread making school. Don’t think that exists any longer but am checking into it. It may have changed names. Lalo, your chocolate chip recipe. I remember as it being the very best !